All the way back in early March, I reported that I’d had a root-canaled front tooth extracted. Almost half a year on, we’re well overdue for an update. Summary: getting the tooth yanked was definitely a good idea. Root canals have no blood supply to bring oxygen and carry away toxins, but they are perfectly placed to pick up and harbor infections and, again, no blood supply means no white blood cells to deal with infections. Mine didn’t smell bad like some people report, but there were visible signs of infection. 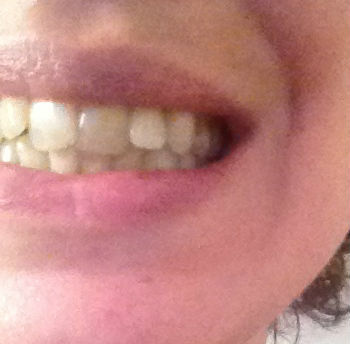 However, the “thereafter” portion of missing a front lateral incisor, the cosmetic aspect, how to fill the gap… that’s been a much bigger issue than I was prepared for. In retrospect, I wish I had done a lot more research and acquired more of a roadmap for what I was getting into. I have something to fill the gap right now, but the story is far from over. Once the tooth is gone, no replacement is going to be perfect, and I ran into unexpected issues with effects on my neurological functioning. In short, it meant there wasn’t a good clot at the site of extraction--I bled little, and the small clot sloughed out. This meant the bone was exposed. I didn’t have infection or malodor, but I did have significant pain for more than two weeks, when normally the pain is less intense and over within a week. I’m a donkey, stupid-high pain threshold. I washed it, applied ozonated olive oil, ate little and only blended foods, but otherwise didn’t do anything for the pain. But this also meant we couldn’t even start to work on filling the gap until early June. ("Work"=taking impressions and a couple rounds of color/shape/size matching, none of which addressed the actual attachment mechanics.) I got used to how the absence of tooth caused my lip to cave in slightly at the front, how the inner skin of that part of the lip would get dry. I started putting my hand in front of my face when speaking, keeping my lips together when I smiled. I thought of Stoic practitioners who deliberately dressed down to cure themselves of attachment to “what others think” and wondered if I should just embrace the gap, not being one to place much emphasis on appearance anyway. At the same time, I was beginning to work with people and receiving accolades and encouragement to go put myself out there in high-end places. Along with such encouragement came the advice “Get your tooth first, before presenting yourself.” A friend warned that leaving a gap could cause the other teeth to migrate with undesirable consequences. So, what could I do? This is where I regret not having been more proactive with my research. I was overwhelmingly busy at the clinic at the time, but that’s not an excuse for failure of due diligence with my own core hardware/live organic body! I wasn’t really a candidate for an implant, if only for financial reasons. That left a “partial,” also called a “flipper,” or else a Maryland bridge with a promising update using zirconium and less or no metal. The partial has the prosthetic tooth on an acrylic plate, which I had assumed would be tiny. I could at least have googled some images! The Maryland bridge as practiced by my dentist bonds the prosthetic tooth to its two adjacent teeth. The model at her office shows much smaller points of contact than in the images linked above. I listened to someone’s advice not to mess with the live teeth and rejected it out of hand, which left me with the partial/flipper. And so, perhaps because I felt I had no choice, I wasn’t prepared for the partial when it finally came. I wasn’t prepared to have the entirety of my upper palate covered over just for one little tooth at the front! The good part about the long wait was that by early June I’d gotten solid on my ketogenic diet and was more stable than I’d ever been; I also now bleed when I get cut. And so I was able to stay calm when presented with this partial rather than freaking out as most of myself instinctively wished to do. And so I gave it a good, honest try and wore it all day long for several days. But I had to stop with the honest try when I realized that I wasn’t just being a fuss-pot. That plate holding my whole palate together was compressing my brain, and I was starting to get serious seizy symptoms! When I realized I didn’t feel safe to drive, I had to go back to the dentist and ask for help. I said I cared less about perfect aesthetics than about my skull being able to move freely, and was there any chance at all that we could cut most of the plate off. Thankfully, they were able to do this for me, and remarkably quickly too. The result was more what I’d originally been expecting. It’s light years more bearable than the original form. But it’s obviously less stable. I wanted it to be less stable--I didn’t want my cranium squeezed. But it still does feel like it affects the freedom of movement of my skull. I avoid wearing it as much as possible. Sometimes I carry it in my shirt pocket when I’m hiking, so that I can put it in quick if I hear other people coming and can smile without being hideous. The concern with the Maryland bridge was that it requires modification of the adjacent teeth to accept a bonding material and that it might restrict the free play of those teeth. But at this point, restricting free play of two teeth is looking a whole lot better than restricting the play of my entire cranium. The acrylic plate also chafes my palate. As I said at the start, there’s no perfect solution when a permanent incisor is extracted. (Unless I can channel something super and grow a new one!) Right now, I’m doing the research I should have done back then and seriously considering the “bridge” option. Ela- Sorry this has been so challenging for you. Thanks for sharing it to remind me to do my own research! Thanks, Meryl! I hope we're all able to figure out the best solutions for ourselves. I've been hanging with this flipper (you taught me that word for it) and finding it makes me even more reclusive, because I don't want to have to go out and wear it. I hope you can get an implant. You should not let the cost deter you from the best solution. Probably there is a university dental school where you can have it done and pay for it on a payment plan or else do a crowd funder. I know what you mean about not wanting to mess with the good teeth. I have opted against veneers because it would entail destroying the teeth in order to fit them. So good to hear from you, and I'm so sorry it's taken for ever to respond to this comment! Interesting, as I'm still debating the question and am erring toward getting the "bridge" although it affects the adjacent teeth.